I really love pasta. If my metabolism would cooperate, I would easily eat pasta every day. It is so easy, hearty, versatile, and the perfect vessel for great sauces and cheeses (my true favorite thing). I like pasta from a blue box covered with powdered orange cheese, I love pasta in a bulk package, I love pasta that comes fresh from the deli, but I really love fresh pasta from my own two hands. Yes, it is guaranteed to get flour all over your kitchen, but it is incredibly easy and absolutely worth it. I like to make a deal–I make it, you clean up. (Unfortunately it doesn’t always work like that.) Just do it. Clean off a counter space, prepare for the flour explosion, clean as you go, and relish in your accomplishment at the end. 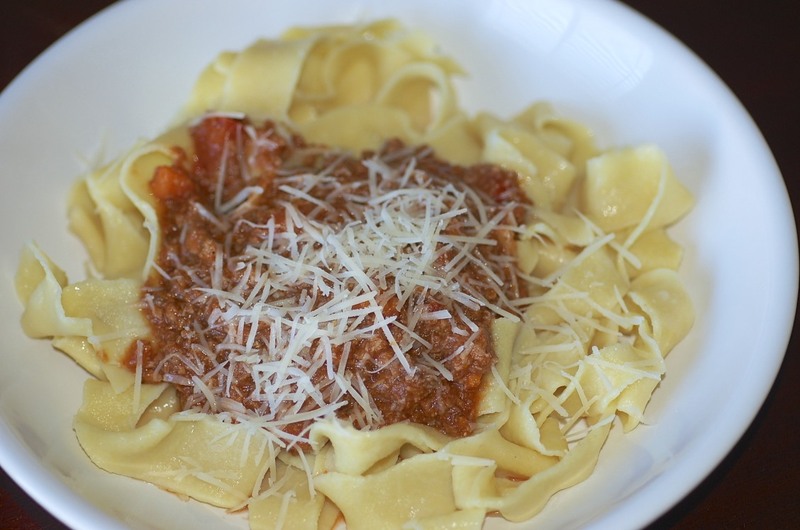 This time around, we made fresh pappardelle to partner with a wild boar ragu. The pasta was the perfect compliment and serving vessel for the sauce. Right now I am eating grilled chicken that marinated in a bruschetta sauce that would be amazing with this pasta. This will forever be my go-to pasta recipe for hearty sauces or even sauteed veggies with basil and feta. The pasta is even capable of standing on its own with flavored olive oil and parmesan. It’s that good. Trust me. 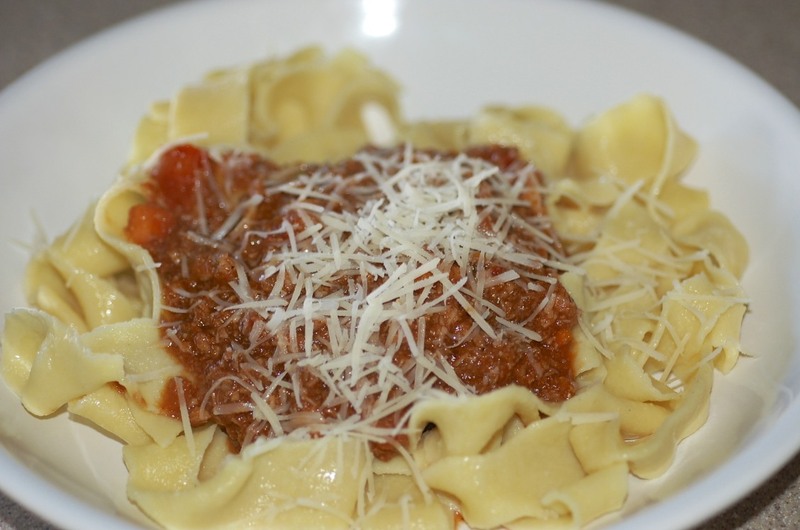 If you are nervous about making fresh pasta, then this is the perfect starter recipe for you. You can’t screw it up, I promise. And it is absolutely delicious. In a large bowl, sift together both of the flours. Make a well in the center. Carefully place the eggs, olive oil, and a dash of salt into the well. With a fork, break up the eggs, then gently mix all of the ingredients together until just combined. Split the dough in two. Flour the surface of your workspace. Knead the first ball of dough by pushing it away from you, then folding it back over itself, then repeating. Continue until the dough is smooth and elastic, about 5 minutes. Do the same with the other dough ball. Cover each dough ball with saran wrap and refrigerate for 30 minutes or overnight. After the dough has rested, lightly flour your work surface again. Starting at the middle, roll out your dough evenly and smoothly. Do this by letting up on the pressure as you get towards the edges. 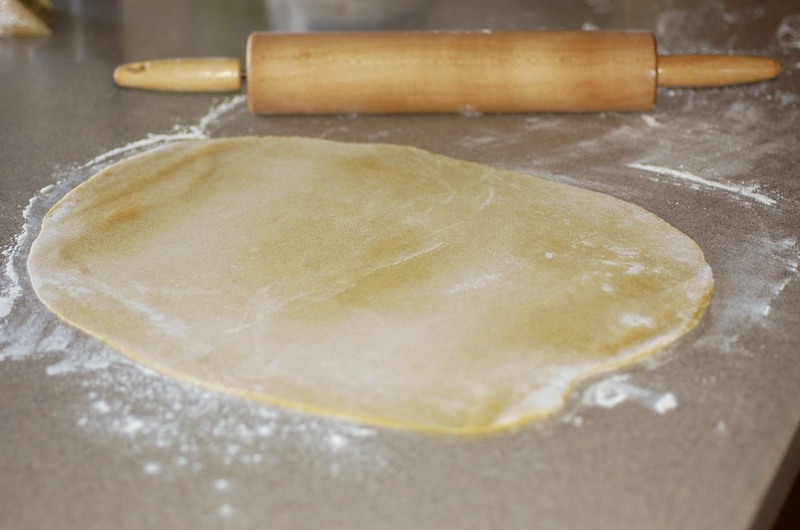 Continue rolling the dough into a sheet until you can see your fingers through the bottom and it is your desired width. Let dry for 10ish minutes. 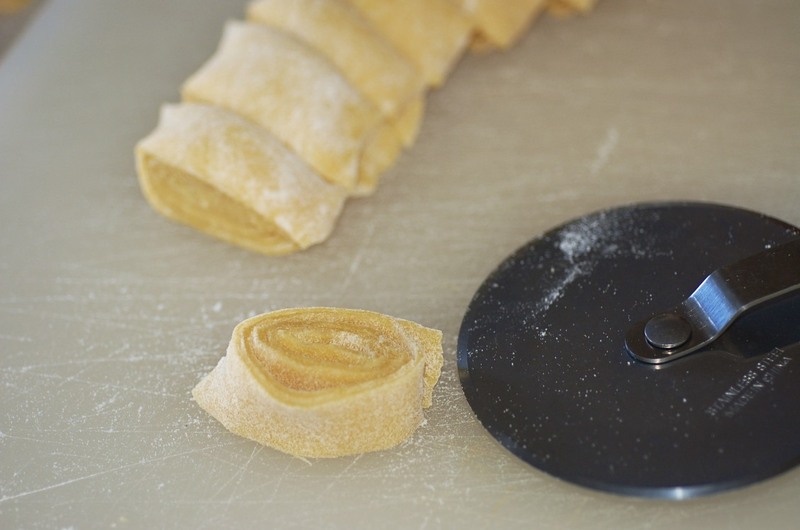 To cut the pappardelle, lightly dust the top of the dough sheet with flour, then loosely roll it into a cylinder. Use a pizza cutter or sharp knife to cut the dough into 3/4 inch wide slices. 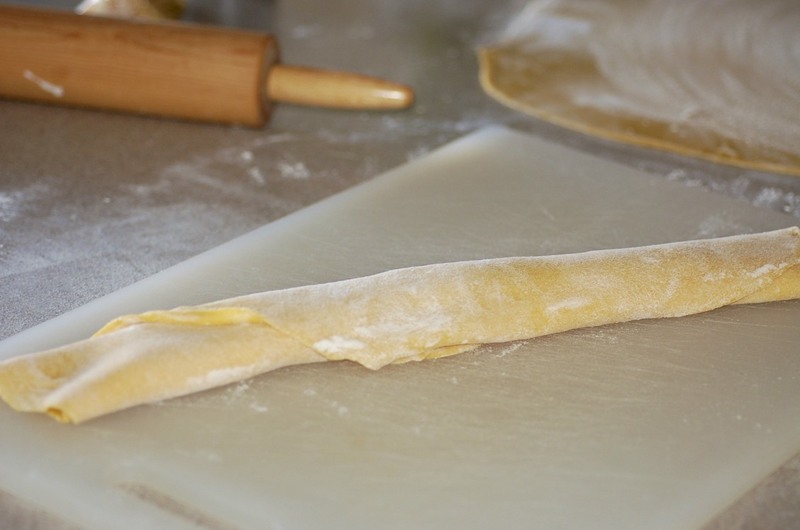 Unwrap the noodles and dust with semolina and gently toss to separate. Carefully strain and either coat with a little olive oil or be ready to serve.